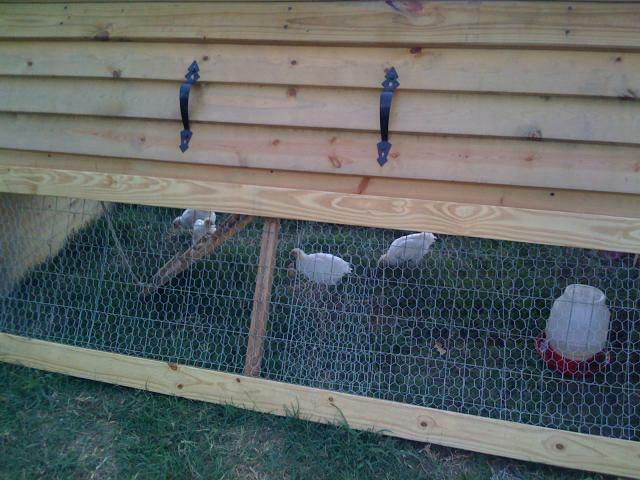 We had our Rhode Island Reds in a coop that was WAY out in the pasture FAR from the house. After a racoon invasion, I moved them all to a PVC tractor this summer enclosed by an electro net closer to the house. In the meantime, we had this shed by our house that was a junk collector. We spent this summer cleaning out the shed and converting it to a chicken coop. It currently is housing our Plymouth Rocks and RIR. They each have their own stalls, roosts, laying boxes, and then a covered yard and then a bigger yard that keeps expanding as they run out of grass. There are two more stalls on the other side I need to finish to get the babies out of the brooder (they are a week old) and to make room for our Wheaten Marans that are on the way! The first enclosed yard (the wood framed) is covered with blue pvc roofing with roosts in there to hang out in a covered "outdoor" area. We started with that until the grass was all gone in a week. 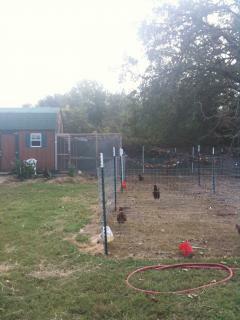 Then we added another yard to it covered with bird netting and surrounded with a 2' wire apron. That lasted a few weeks until the grass was gone again. We have expanded the yard again and as you can see, we will be adding more to it again! lol! 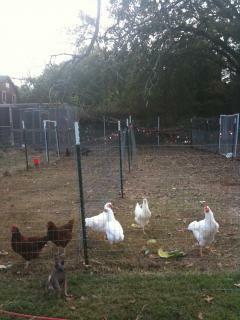 We also let them out to free range when we can hang out with them and watch them. I also hung out some christmas lights over the yard to discourage hawks from flying in and also to discourage predators at night. Now that bird netting is also over this area, when a hawk comes by (we have lots of hawks!) they all run under the netting and then to the PVC roofing covered area if the threat gets worse. We havent lost one to a hawk in about 5 years now... thank God! Also, with the lighting out, I havent seen any raccoons/coyotes over here. Our area has all the predators but bears. We have bobcats, cougars, coyotes, raccoons, foxes - you name it. So security has to be tight around here! Notice in this picture, is our blue chihuahua. He babysits the chickens everyday and is *obsessed* with them! If anyone gets too close to the outer edges he barks at them to move away. When they are free ranging, he makes them all stay together and keeps them from the edge of the woods. Its the most peculiar thing! Never knew a chihuahua was a chicken herder! During the racoon invasion, I had him sleeping in the coop with the adults guarding everyone until we could get the problem fixed. I put him in after the adults were all up high on their roosts. He slept in the nesting box and barked at every racoon that came by. He kept them safe until we could get them all moved up closer to the house! The hens will peck him and he just moves on, doesn't seem to mind at all!